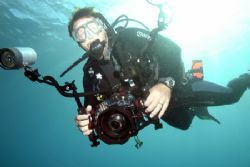 I use a Canon 7D in an Ikelite housing with dual 160 strobes. I have been diving siince 1994 and have been taking U/W pictures since 1997. Hawaii is my home and I love diving Oahu's North shore and Kona area on the big Island.